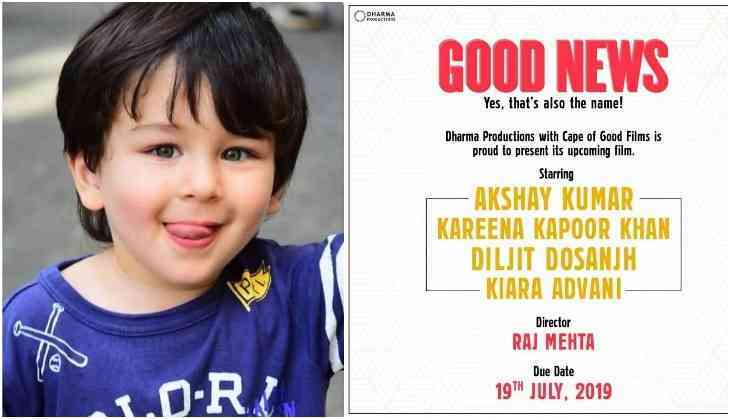 Home » Bollywood News » Karan Johar all set to launch Taimur in Kareena Kapoor and Akshay Kumar starrer Good News! It looks like that Karan Johar has decided to launch another star kid and another kid of Saif Ali Khans clawn. According to the current reports, Saif Ali Khan and Kareena Kapoor Khan's son Taimur is all set to make a debut on silver screen. Reports are that Taimur will have a cameo on Kareena Kapoor Khan starrer film Good News. Good News stars Kareena Kapoor Khan, Akshay Kumar, Diljit Dosanjh, and Kiara Advani in the leading roles. Taimur is already a star on social media and especially for his gestures toward the cameras. Kareena calls Taimur as Tim and she is always awful for his playful activities in front of the camera. We even had seen a video of Taimur Ali Khan with Kiara Advani from the sets of Good News. In this video, we saw Kiara Advani having a race with Taimur and she losses to him. Now sources has revealed that it was actually a shot from the film. Reports are that Taimur will have a cameo for the last 10 minutes in the film. Good News marks the collaboration with Akshay Kumar and Kareena Kapoor Khan after 10 years of their last collaboration Kambhakt Ishq. However, they also have seen in Gabbar is Back in 2015, but in that film, Kareena had a short cameo role.